RamFam: Winter's favorite toy - books! Winter's favorite toy - books! Post a photo of your baby with her/his first ever favorite/comfort toy. Write some details of your fondest memory of your baby and her toy. This will make a good moment when your baby grows up! Lastly, don’t forget to add the link to your website’s at the end of the page. I’m sure many moms would love to see your sites, too! Winter loves toys too but if you put toys and books in front of her she'll rather pick up a book and start flipping the pages or will ask me or the hubby to read. Winter definitely got this from her daddy because i didn't like reading until I met my husband lol (Well i still don't read much only certain books by James Patterson). Hubby lovesss to read! 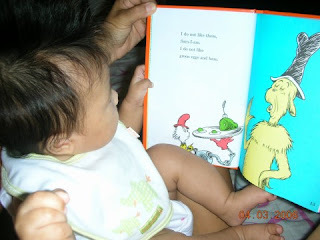 I/We (if hubby is home) makes sure to read a book to her every day and before going to bed it is a must. 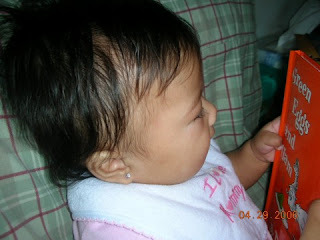 Loves to read her bedtime story book...reading Hansel & Gretel in this pic. thanks for the tag! will grab it soon! oh sya, take care, miss Winnie! I don't like green eggs and ham!